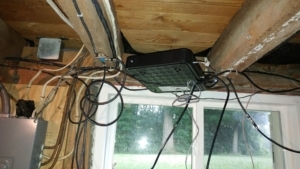 The Ubee DVW32CB Advanced Wireless Gateway that Spectrum is using now to provide customers with internet and VOIP phone service, was simply supported by a single coax cable line and ready to fall at any given moment. Not only that, but no network cable was run to a wired desktop computer which had NO WIRELESS CAPABILITIES. The device was also installed in the basement, for some reason. This is far away from the physical computer. Now to add insult to injury, the technician saw that the computer was hooked up to a network cable, but it was the old DSL modem/router, which that very same technician had essentially disabled when he connected the phone jacks to their device. After I saw how Spectrum/Time Warner Cable was installing their new Ubee devices for internet and phone service, I stayed at the customer location and assisted the sales person who sold the customer the service with correcting the installation. Did you catch that? Yes, it was a sales person. This is because Spectrum/Time Warner Cable uses contracted service technicians to perform some of their work. Although they may have Spectrum/Time Warner vehicles they may not be actually from that company. We did get lucky though with this particular sales person as he used to be a technician. He had some knowledge about the service installation, but not about the actual device being installed, nor about some additional ways of installing VOIP services. It’s a good thing I was there to assist otherwise the customer would be lacking in services.